Central has revived the O-Club. The original Central O-Club, started in 1920 and it was created to intensify school spirit and promote good sportsmanship. Any male Eagle athlete or male student manager who won a varsity letter was eligible. The Girls Athletic Association was organized in the spring of 1923 to promote interest in women’s sports, opening up opportunity for any girl to participate in athletics according to her interests and abilities. While the Girls Athletic Association and O-Club were separate entities, they worked hand in hand to sponsor activities such as the faculty basketball game and post-season sports banquets. In the 1971-72 school year, the Girls Athletic Association disbanded, and a decade later, in 1981, the boys O-Club followed suit. Last year, the 2012-13 school year, after 30 years of dormancy, Central’s O-Club was reconstituted and now includes both men and women. According to Ms. Jess Renshaw,Central’s O Club sponsor, members of the new O club have been nominated by coaches and selected from the pool of nominations as students most aptly personifying the ideals of our organization: academic achievement, pursuit of athletic excellence, leadership and character development, and community involvement. In order to be considered for membership, a student-athlete must first be nominated by a coach and go through a preliminary review. The qualifications for membership are that the student-athlete must be in the 11th or 12th grade while a member, must have and maintain a cumulative GPA of 3.0 or higher, and must be an active varsity letter winner in at least 2 activities. One letter must be earned in a sport, the second may be earned either in a second sport or in a club or activity at Central High School. Once a student-athlete has been nominated, the sponsor and administration check for absences, referrals, grades, and difficulty of classes, among other things. Once the preliminary review is complete, the candidate is sent a letter of invitation with an application form enclosed. The candidate must complete the application, which includes two short essays. When the applications are reviewed and voted on, the final letter of congratulations is sent and the candidate is inducted shortly after at the recognition ceremony. There is a recognition induction ceremony in the fall and the spring. 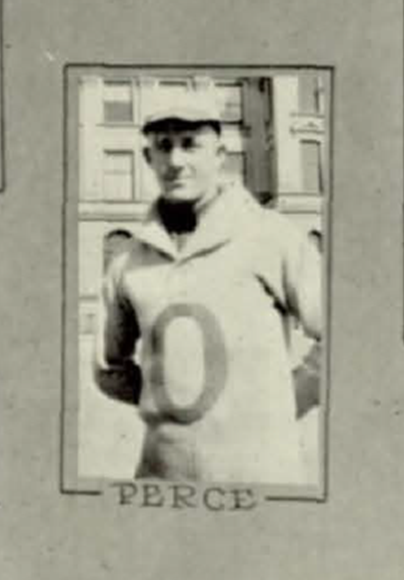 Photo from 1923 O-Book, Ward “Perce” Percival.